Anabaptism (from Neo-Latin anabaptista, from the Greek ἀναβαπτισμός: ἀνά- "re-" and βαπτισμός "baptism", German: Täufer, earlier also Wiedertäufer[lower-alpha 1]) is a Christian movement which traces its origins to the Radical Reformation. The movement is generally seen as an offshoot of Protestantism, although this view has been challenged by some Anabaptists. Approximately 4 million Anabaptists live in the world today with adherents scattered across all inhabited continents. In addition to a number of minor Anabaptist groups, the most numerous include the Mennonites at 2.1 million, the German Baptists at 1.5 million, the Amish at 0.3 million and the Hutterites at 0.05 million. In the 21st century there are large cultural differences between assimilated Anabaptists, who do not differ much from evangelical or mainline Protestants and traditional groups like the Amish, the Old Colony Mennonites, the Old Order Mennonites, the Hutterites and the Old German Baptist Brethren. James M. Stayer, Werner O. Packull, and Klaus Deppermann disputed the idea of a single origin of Anabaptists in a 1975 essay entitled "From Monogenesis to Polygenesis", suggesting that February 24, 1527, at Schleitheim is the proper date of the origin of Anabaptism. On this date the Swiss Brethren wrote a declaration of belief called the Schleitheim Confession. The authors of the essay noted the agreement among previous Anabaptist historians on polygenesis, even when disputing the date for a single starting point: "Hillerbrand and Bender (like Holl and Troeltsch) were in agreement that there was a single dispersion of Anabaptism ..., which certainly ran through Zurich. The only question was whether or not it went back further to Saxony. ":83 After criticizing the standard polygenetic history, the authors found six groups in early Anabaptism which could be collapsed into three originating "points of departure": "South German Anabaptism, the Swiss Brethren, and the Melchiorites." According to their polygenesis theory, South German–Austrian Anabaptism "was a diluted form of Rhineland mysticism", Swiss Anabaptism "arose out of Reformed congregationalism", and Dutch Anabaptism was formed by "Social unrest and the apocalyptic visions of Melchior Hoffman". As examples of how the Anabaptist movement was influenced from sources other than the Swiss Brethren movement, mention has been made of how Pilgram Marpeck's Vermanung of 1542 was deeply influenced by the Bekenntnisse of 1533 by Münster theologian Bernhard Rothmann. Melchior Hoffman influenced the Hutterites when they used his commentary on the Apocalypse shortly after he wrote it. Roman Catholics and Protestants alike persecuted the Anabaptists, resorting to torture and execution in attempts to curb the growth of the movement. 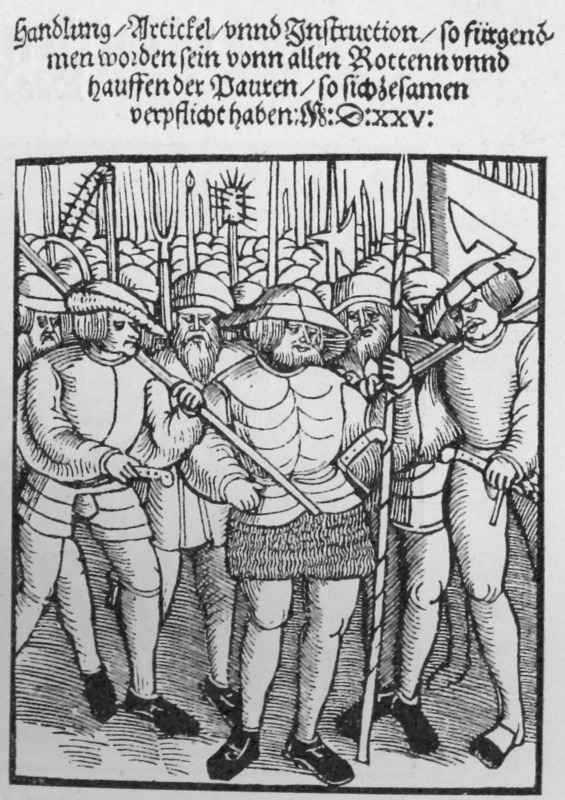 The Protestants under Zwingli were the first to persecute the Anabaptists, with Felix Manz becoming the first martyr in 1527. On May 20 or 21, 1527, Roman Catholic authorities executed Michael Sattler. King Ferdinand declared drowning (called the third baptism) "the best antidote to Anabaptism". The Tudor regime, even the Protestant monarchs (Edward VI of England and Elizabeth I of England), persecuted Anabaptists as they were deemed too radical and therefore a danger to religious stability. The persecution of Anabaptists was condoned by ancient laws of Theodosius I and Justinian I that were passed against the Donatists, which decreed the death penalty for any who practised rebaptism. Martyrs Mirror, by Thieleman J. van Braght, describes the persecution and execution of thousands of Anabaptists in various parts of Europe between 1525 and 1660. Continuing persecution in Europe was largely responsible for the mass emigrations to North America by Amish, Hutterites, and Mennonites. Unlike Calvinists, Anabaptists failed to get a recognition in the Peace of Westphalia of 1648 and persecution continued in Europe well after that treaty. Total worldwide membership of the Mennonite, Brethren in Christ and related churches totals 1,616,126 (as of 2009) with about 60 percent in Africa, Asia and Latin America. In 2015 there were some 300,000 Amish, more than 200,000 "Russian" Mennonites in Latin America, some 60,000 to 80,000 Old Order Mennonites and some 50,000 Hutterites, who have preserved their ethnicity, their German dialects (Pennsylvania German, Plautdietsch, Hutterisch), Plain dress and many other old traditions. Persons often associated with the Neo-Anabaptist movement include Stanley Hauerwas, Scot McKnight, Rob Bell, Brian McLaren, Jim Wallis, and Shane Claiborne. Dirk Willems saves his pursuer. This act of mercy led to his recapture, after which he was burned at the stake. Luyken, Jan (1685), Dirk Willems . ^ Since the middle of the 20th century, the German-speaking world no longer uses the term "Wiedertäufer" (translation: "Re-baptizers"), considering it biased. The term Täufer (translation: "Baptizers") is now used, which is considered more impartial. From the perspective of their persecutors, the "Baptizers" baptized for the second time those "who as infants had already been baptized". The denigrative term Anabaptist signifies rebaptizing and is considered a polemical term, so it has been dropped from use in modern German. However, in the English-speaking world, it is still used to distinguish the Baptizers more clearly from the Baptists, a Protestant sect that developed later in England. Cf. their self-designation as "Brethren in Christ" or "Church of God": Stayer, James M. (2001). "Täufer" (in German). Theologische Realenzyklopädie (TRE). 32. Berlin, New York: Walter de Gruyter. pp. 597–617. ISBN 3-11-016712-3. "Brüder in Christo", "Gemeinde Gottes". .
^ Bruening, Michael W. (April 5, 2017) (in English). A Reformation Sourcebook: Documents from an Age of Debate. University of Toronto Press. p. 134. ISBN 9781442635708. "In 1527, Sattler presided over a meeting at Schleitheim (in canton Schaffhausen, on the Swiss/German border), where Anabaptist leaders drew up the Schleitheim Confession of Faith (doc. 29). Sattler was arrested and executed soon afterwards. Anabaptist groups varied widely in their specific beliefs, but the Schleitheim Confession represents foundational Anabaptist beliefs as well as any single document can." ^ Hershberger, Guy F. (March 6, 2001) (in English). The Recovery of the Anabaptist Vision. Wipf & Stock Publishers. p. 65. ISBN 9781579106003. "The Schleitheim articles are Anabaptism's oldest confessional document." ^ van der Zijpp, Nanne. "Sacramentists". Global Anabaptist Mennonite Encyclopedia Online. Archived from the original on February 27, 2007. http://www.gameo.org/encyclopedia/contents/S2384.html. Retrieved April 12, 2007. ^ Fontaine, Piet FM (2006). "Chapter I – part 1 Radical Reformation – Dutch Sacramentists". The Light and the Dark: A Cultural History of Dualism. XXIII. Postlutheran Reformation. Utrecht: Gopher Publishers. Archived from the original on May 9, 2007. http://home.wanadoo.nl/piet.fontaine/volumes/vol23/index1.htm?vol23_ch1_part1.htm. ^ Carrol, JM (1931). The Trail of Blood. Lexington, KY: Ashland Avenue Baptist Church. Archived from the original on February 21, 2009. https://web.archive.org/web/20090221104428/http://www.trailofblood.com/The%20Trail%20Of%20Blood.htm. ^ (1987) "The Chronicle of the Hutterian Brethren, Known as Das grosse Geschichtbuch der Hutterischen Brüder". ^ "1525, The Anabaptist Movement Begins". http://www.christianitytoday.com/history/issues/issue-28/1525-anabaptist-movement-begins.html. Retrieved December 27, 2017. ^ Klaassen, Walter (1985). "A Fire That Spread Anabaptist Beginnings". Waterloo, ON, Canada: Christian History Institute. https://christianhistoryinstitute.org/magazine/article/anabaptist-beginnings. Retrieved December 27, 2017. ^ Bossert, Jr., Gustav; Bender, Harold S.; Snyder, C. Arnold (2017). "Global Anabaptist Mennonite Encyclopedia Online". In Roth, John D.. Global Anabaptist Mennonite Encyclopedia Online. http://gameo.org/index.php?title=Sattler,_Michael_(d._1527)&oldid=143732. , reprinted from Bossert, Jr., Gustav; Bender, Harold S.; Snyder, C. Arnold (1989). "Mennonite Encyclopedia". In Bender, Harold S.. Mennonite Encyclopedia. Harrisonburg, VA: Herald Press. Vol. 4, pp. 427-434, 1148; vol. 5, pp. 794-795. ^ "Life Among The Bruderhof". The American Conservative. http://www.theamericanconservative.com/dreher/life-among-the-bruderhof/. ^ "Apostolic Christian Church of America". http://gameo.org/index.php?title=Apostolic_Christian_Church_of_America. ^ "Church Community is a Gift of the Holy Spirit - The Spirituality of the Bruderhof | Anabaptism | Religion & Spirituality" (in en). https://www.scribd.com/document/354366939/Church-Community-is-a-Gift-of-the-Holy-Spirit-The-Spirituality-of-the-Bruderhof. ^ "London Baptist Confession of 1644". spurgeon.org. Archived from the original on June 17, 2010. https://web.archive.org/web/20100617103253/http://www.spurgeon.org/~phil/creeds/bc1644.htm. "Of those Churches which are commonly (though falsely) called ANABAPTISTS;"
^ a b DeYoung, Kevin. "The Neo-Anabaptists". https://blogs.thegospelcoalition.org/kevindeyoung/2009/06/03/neo-anabaptists/. Retrieved March 25, 2017. ^ (Fall 2013) "New Calvinists and Neo-Anabaptists: A Tale of Two Tribes". Direction: A Mennonite Brethren Forum 42 (2): 178–194. Retrieved on March 25, 2017. ^ Tooley, Mark. "Mennonite Takeover?". https://spectator.org/38818_mennonite-takeover/. Retrieved March 25, 2017.
van Braght, Thieleman J (1950) , Martyrs Mirror, Scottdale, PA: Herald Press, ISBN 978-0-8361-1390-7, https://books.google.com/books?id=SCnXAQAACAAJ . Dyck, Cornelius J (1967), An Introduction to Mennonite History, Scottdale, PA: Herald Press, ISBN 0-8361-1955-X, https://books.google.com/books?id=X78FAAAACAAJ . Estep, William R (1963), The Anabaptist Story, Grand Rapids, MI: William B Eerdmans, ISBN 0-8028-1594-4, https://books.google.com/books?id=BF8D09JSfzwC . Klaassen, Walter (1973), Anabaptism: Neither Catholic Nor Protestant, Waterloo, ON: Conrad Press, https://books.google.com/books?id=SCnXAQAACAAJ . Marpeck, Pilgram (1978), Klassen, William; Klassen, Walter, eds., Covenant and Community: The Life, Writings, and Hermeneutics, Scottdale, PA: Herald, https://books.google.com/books?id=1HWpGQAACAAJ . Packull, Werner O (1995), Hutterite Beginnings: Communitarian Experiments During the Reformation, Baltimore, Maryland: The Johns Hopkins University Press, ISBN 0-8018-6256-6, https://books.google.com/books?id=hHW6nS0-DQQC . Stayer, James M (1994) , The German Peasants' War and Anabaptist Community of Goods, Montréal: McGill-Queen's Press, MQUP, ISBN 0-7735-0842-2, https://books.google.com/books?id=MeFSqubf6VAC . Williams, George Hunston (2000) , The Radical Reformation (3rd ed. ), Truman State University Press, ISBN 0-664-20372-8, https://books.google.com/books/about/The_Radical_Reformation.html?id=5Za7AAAACAAJ . Newman, Albert H, A History of Anti-Pedobaptism, From the Rise of Pedobaptism to AD 1609, Google Books, ISBN 1-57978-536-0, https://books.google.com/books?id=DuVJAAAAMAAJ . Hillerbrand, Hans, Anabaptist Bibliography 1520–1630, Google Books, ISBN 0-910345-03-1, https://www.google.com/books?id=cYFAAQAACAAJ . Fast, Heinhold (1999). "Anabaptists". The Encyclopedia of Christianity 1: 45–48. Mary E. Bamford. "In Editha's Days. A Tale of Religious Liberty". In Harrison, Larry. https://books.google.com/books?id=v5pUGwAACAAJ. Mennonite Encyclopedia. ISBN 0-8361-1018-8. https://books.google.com/books?id=4OI5AgAACAAJ. Baylor, Michael G.. "Revelation & Revolution: Basic Writings of Thomas Muntzer". ISBN 0-934223-16-5. https://books.google.com/books?id=xAKM85a4EekC. Verduin, Leonard. "The Anatomy of a Hybrid : a Study in Church-State Relationships". ISBN 0-8028-1615-0. https://books.google.com/books?id=26ZOAAAACAAJ. Thieleman J. van Braght. "The Bloody Theater or Martyrs Mirror". ISBN 0-8361-1390-X. https://books.google.com/books?id=_g_cJgAACAAJ. J. Gordon Melton, ed. "The Encyclopedia of American Religions". ISBN 0-8103-6904-4. https://books.google.com/books?id=ZnoYAAAAIAAJ. Pearse, Meic, The Great Restoration: The Religious Radicals of the 16th and 17th Centuries, https://books.google.com/books/about/The_great_restoration.html?id=FSoQAQAAIAAJ&redir_esc=y . Cohn, Norman. "The Pursuit of the Millennium". ISBN 0-19-500456-6. https://books.google.com/books?id=tDVaYvh4qj0C. Verduin, Leonard. "The Reformers and their Stepchildren". ISBN 0-8010-9284-1. https://books.google.com/books?id=LUM-FCtmCZAC. Peter Hoover. "The Secret of the Strength". http://www.elcristianismoprimitivo.com/The%20Secret%20of%20the%20Strength.pdf. Retrieved December 27, 2017. "Anabaptism". Global Anabaptist Mennonite Encyclopedia Online. http://gameo.org/index.php?title=Anabaptism. Retrieved September 11, 2013. "The Story of the Church: The Protestant Reformation: The Anabaptists and Other Radical Reformers". Ritchie Family Page. Archived from the original on December 17, 2005. http://www.ritchies.net/p4wk4.htm. Retrieved December 15, 2005. "The Anabaptist Story". The Reformed Reader. Archived from the original on December 15, 2005. http://www.reformedreader.org/history/anabaptiststory.htm. Retrieved December 15, 2005.